Susan G. Komen Greater NYC uniquely funds small local grassroots breast health programs and national breast cancer research. Thanks to many amazing donors and supporter, since our founding in 1990, Komen Greater NYC has raised $60 million and awarded $43 million in grants. 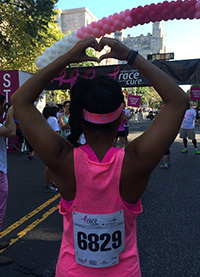 Komen Greater NYC is committed to removing barriers and ensuring access to culturally and linguistically-appropriate breast health screening, treatment, education, outreach and support services for low-income and uninsured women in New York City, on Long Island, and in Westchester and Rockland Counties. For many of our grantees, Komen is one of the few funders â€“ willing and able to invest in their critical programs and services. Just in the past five years alone, we have helped almost 1 million people - providing mammograms, clinical breast exams, patient navigation, psychosocial support, transportation, meals, legal services, educational classes and materials, and much more to our underserved neighbors.